When we tested this big disc sander, we were more than impressed by its smooth operation. A powerful 1 HP motor drives this heavy-duty machine for all-day dependability. 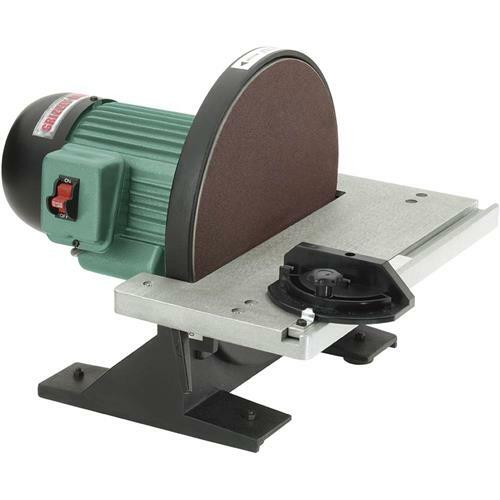 Features include an 8-1/4" x 17-1/4" cast-aluminum table that tilts from 0° - 45°, cast-iron base with built-in dust port, 110 volt motor that turns at 1725 RPM, and a miter gauge. This really is a super deal! Approximate shipping weight: 67 lbs. Seems to be a good, heavy duty piece of machinery. The fit and finish of the cast base is a little rough where it attaches to the table but other than that I would recommend it. The motor and disk are totally without vibration and nearly silent. I have to remember to turn it off. The aluminum table is a compromise for cost. I sanded with DA 180 grit/ 320 grit. Paste wax. Silky smooth now and I do almost totally metal work. The table adjustment is a total POS. Position and lock down, it locks in a different position so you have to fuss with it. Live with it or build a better adjustment system. The casting and motor/disk are worth it. The motor is overrated but what's new on Chinese stuff? Used the 12" disc sander a couple of times and it seems to be well built. Kicks out a lot of dust because I haven't attached a dust collector. The manual is well written. This is a extremely well built sander, very quiet and a nice tool to have in the shop. This is the first disc sander I've ever owned, so I don't really have anything to compare it to. That being said, I am very pleased with this one. It is super quiet, and eats away at what you feed it very easily. This is well built sander. Very solid. I highly recommend this sander who looking for a accurate disc sander. 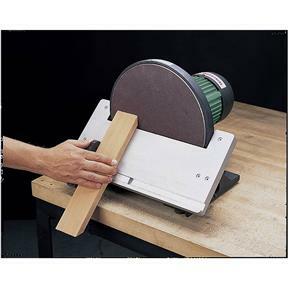 This sander is a solid constructed piece of equipment and has to power to aggressively handle sanding requirements. This machine is super easy to set up and use. It runs ultra smooth. As for the table, I used a metal prep pad on it for a few min then a couple coats of wax. Now my parts slide on the table with no issues. 1. The table surface is a brushed aluminum which is rough and wood does not slide on it easily even after a coat of paste wax; it should be machine smooth. 2. The miter gauge slot is non-standard (less than 0.74 inches) so standard miter gauges will not fit; a serious oversight. 3. The miter gauge itself is a cast metal piece and does not have a machined face. Mine has a high spot in it so the work will not stay true on it. This is also a serious design flaw. I have been sick and recovering. the project I bought the sander is still on hold. I have unboxed it and it looks to be a quality product. I am sure it will perform as expected. Love this thing...take out of box - add sanding disk - plug in....that is about the easiest set up ever. Don't press too hard you can stall it .....but really removes material fast...I am definitely more efficient with it. No hesitation with recommendation. I use it for hardwood, softwood ....round, flat....you name it. They can't have this back!